Originally posted on http://www.thememoryjogger.com.au/rest-day-benefits/ on 28 Nov 2014. That is of course, as long as you aren’t binging on junk food, knocking back half a dozen beers and generally abusing your body. Rest days are important and they should be appreciated. 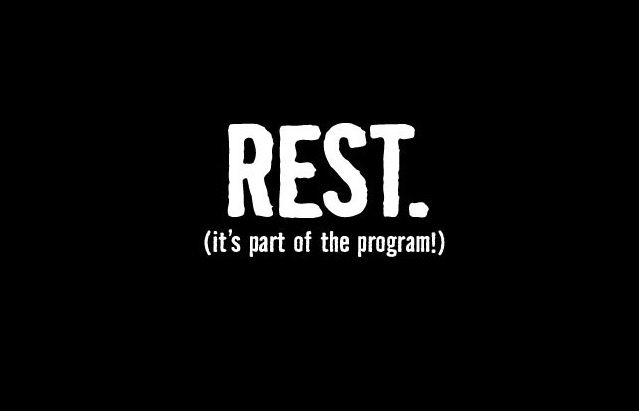 A day of rest is just as important as a training day as it allows the muscles time to repair and recover. It is not uncommon for professional training plans (even for Olympic athletes and other elite sports people) in order to allow the body time to recuperate. Workouts place greater strain on our muscles, tendons, ligaments, bones and joints. Our body’s immune system is activated when there are muscle tears or joint strains, but if the body doesn’t have a break between training events, the system doesn’t have enough time to catch up and start repairing the body. Deciding not to have a rest day raises the risk of injury. If you are like me and a large part of your life is high-impact sport such as running – you need to know that running can place stress on your joints and lower extremities to a level that has the ability to crack bones and tighten muscles. Without the occasional a day off here and there, calf muscles can tighten, tendons of the feet can lead to bone spurs, shin splints can develop, muscle tears and strain can occur and there is so much more. Now of course, rest days will vary in frequency and type depending on the individual, the intensity of workouts and style of exercise. Bodybuilders may only want to take a day off from lifting, but still do cardio or work different muscle groups. Runners may opt for Pilates or Yoga with a focus on different parts of the body. The more experienced you are and the greater level of fitness, the greater tolerance you will have for continuing to do some light activity during a rest day. However, if you are a just getting started in developing your fitness your rest day should probably be a real rest day in which you do little or no activity at all. My simple philosophy is listen to your body – know your body and let it guide you. If you are genuinely sore from a workout and still fatigued then rest is probably just what you need. If, on the other hand, your body just wants to bludge, get out there! Important to note, your nutritional requirements on a rest day should be different to a training day or an event day. Just remember, you won’t be burning anywhere near as many calories off on a rest day, and, the fuel you would need for an intense workout or long run is markedly different to a day of chilling and relaxing. Stick to your nutrition plan, but make it a light day – eat well, eat right, eat on time and drink lots of water and again – listen to your body. On the days you are giving your body a rest, spend the time exercising your brain = healthy body and healthy mind are both keys to reducing the risk of dementia. Any activity that involves thinking and learning can improve your brain health and help protect against dementia. Recent evidence suggests that greater benefit comes from more complex and challenging mental activities. The more brain activities you do, the more frequently you do them and the more complex the activity, the lower your risk of dementia is likely to be, as with keeping a healthy body and monitoring your nutrition. Your body is a temple and should be given the love and attention it needs to enable you to achieve your fitness goals and set you up for a long and happy life. Don’t let it become the “temple of doom” – give it rest when it needs it and don’t abuse the rest days – but use them to make your training days and competing days the best they can be. This entry was posted in Fight Dementia, Fitness, Fund Raising, Marathon Training, Running, Trail Running and tagged alzheimer's, alzheimer's australia, brain, fight dementia, fundraising, health, injury prevention, preparation, rest day, runners, running, trail running, training, ultramarathon. Bookmark the permalink.